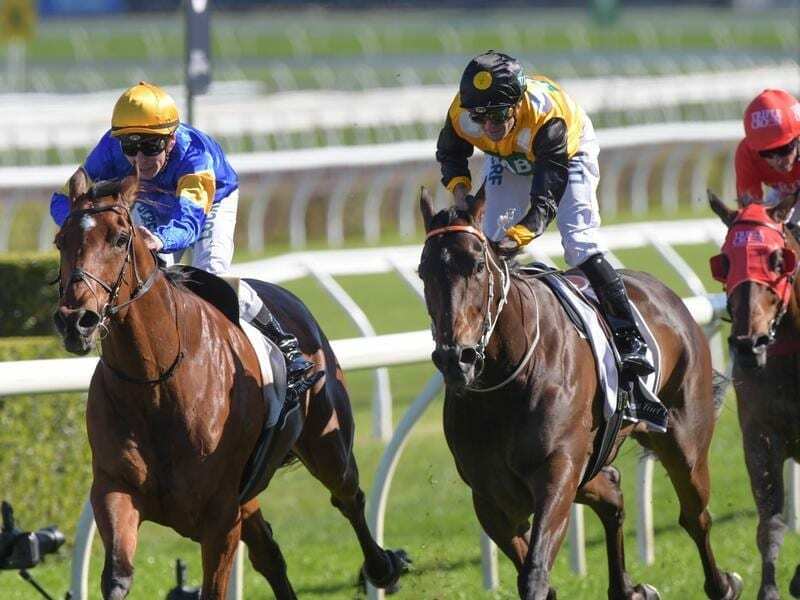 Santa Ana Lane (left) has upstaged a field of Everest contenders with a narrow win at Randwick. Trainer Anthony Freedman has signalled he has the firepower to give the $13 million Everest a shake with Santa Ana Lane beating stablemate Shoals in the Group Two Premiere Stakes at Randwick. The Everest has been hit with the defection of Nature Strip after his unplaced Moir Stakes effort on Friday night and the refusal of Chautauqua to take part in a barrier trial let alone a race. That leaves two vacant slots in the 12-horse race on October 13 but Freedman is happy to have his runners peaking at the right time. Last year’s Everest winner Redzel was the $3.60 favourite in Saturday’s 1200m Premiere ahead of Trapeze Artist ($3.90) with both the top picks for the big race in two weeks. That has now changed with Santa Ana Lane the $7 equal favourite with Vega Magic after he scorched the turf in a track record 1.07.45s after getting a rails run. “They are easy horses to travel and both have done a bit of that,” the Mornington-based Freedman said. “Now it’s just a question of keeping them up to the mark over the next two weeks. While Freedman was celebrating, connections of a couple of others were scratching their heads. Redzel led the field but was a sitting duck inside the final 100 metres, finishing fifth, two lengths behind the winner and a neck behind Trapeze Artist. Until the Freedman pair arrived on the scene, In Her Time ($5.50) briefly looked the winner but had to settle for third, a nose behind Shoals. “She was really really good,” In Her Time’s jockey Corey Brown said. But all honours were with the winner and his confident rider Ben Melham. “I knew he was on target. He’s been on target all preparation,” he said. Kerrin McEvoy is retaining his belief in Redzel. “He went free for the first furlong. I thought he came back underneath me from the half mile,” McEvoy said.